The Synergy range of Heated dry heat recessed display delis, designed to be dropped into a counter surface to form a food servery. Three sizes in the range which accept 100mm deep, GN1/1 size containers. Each display is self-contained and easily installed. 220V/240V 1 phase 50 Hz. Cable Fitted with 2 metres of cable and 13 amp plug. Designed to maintain the temperature of hot food using an energy regulator controlled element providing heat to the base supplementing dimmer controlled quartz halogen heat lamps from above. Full height curved toughened curved glass sneeze screen with over shelf and glass side cheeks. Controls mounted in bright polished stainless steel light box. Operator changeable quartz halogen heat lamps. 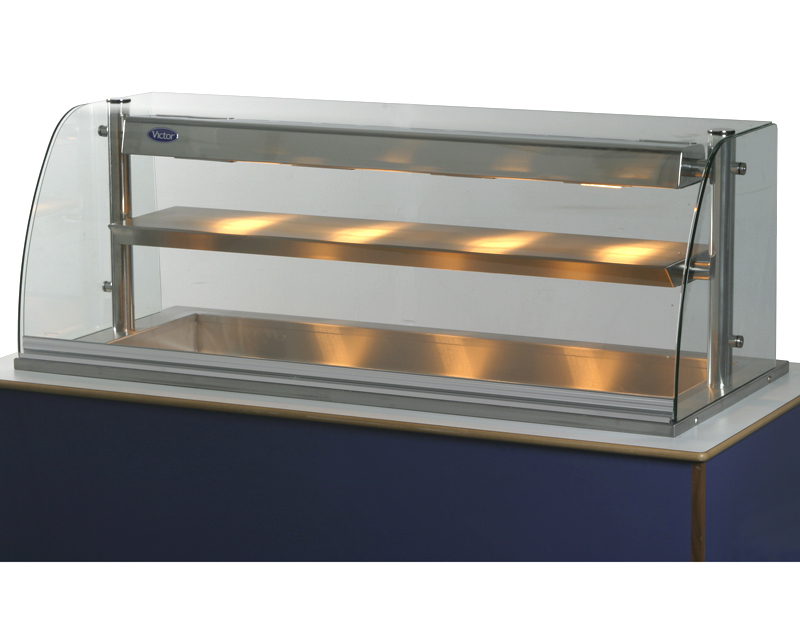 Optimax SQ Carbon Trust approved Patisserie units are available in hot ambient and chilled versions suitable for either assisted or self-service applications. They are perfectly suited for delis coffee shops convenience stores and all food-to-go outlets. Independently tested to EN23953:2005 M1 climate class 3. Approved by The Carbon Trust for the ECA Energy Technology List FCSI/CESA Sustainable Catering Equipment Award 2012 - Highly Commended. Shortlisted for The British Engineering Excellence Awards (BEEA) Green product of the year. Design protected by GB Patent No. 2492998 Unit Shown SMR100ECT with stainless steel base fascia panels. Counter Unit Model No: SMR65ECT - 650mm unit. Model No: SMR100ECT - 1000mm unit. Model No: SMR130ECT - 1300mm unit. Victor brings you this brilliant case study of our successful project for Slaley Hall in Hexham, Northumberland. The requirement was to replace an existing chaffing dishes on tables style breakfast servery with elegant but flexible servery counters. Set in an Edwardian Mansion the choice of materials specified needed to match the elegant surrounds. Copyright © 2018 Victor Online.